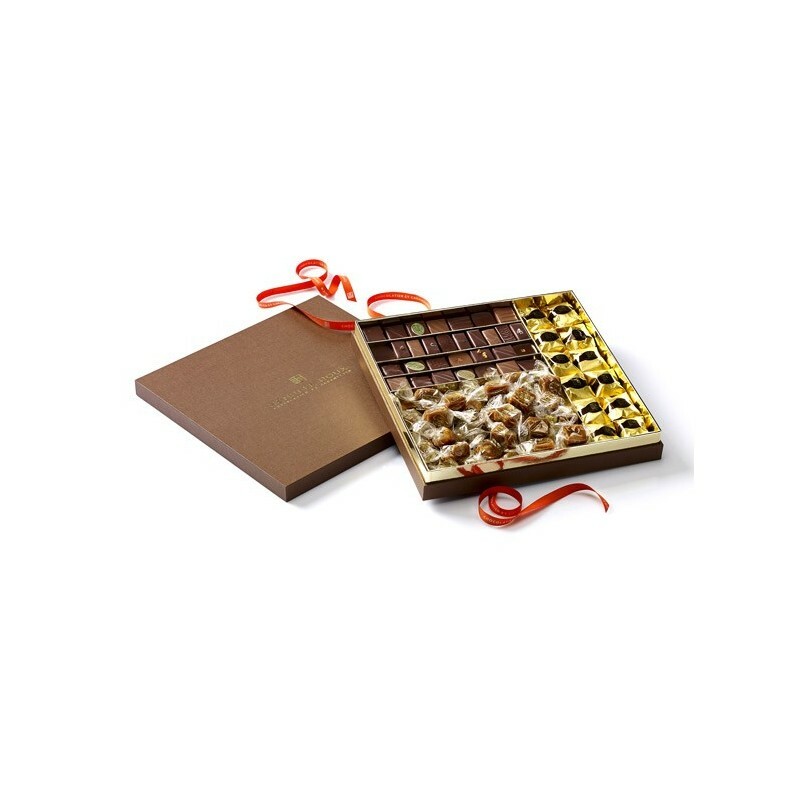 250g Assorted dark/milk chocolate, 12 glazed chestnuts and 350g of CBS® (salted butter caramel). Taste our chocolates and caramels as quickly as possible after their purchase: the quicker they are consumed after making, the more unctuous and fondant. Ingredients: dark, milk and white chocolates [cocoa paste, sugar, cocoa butter, MILK powder, coffee, caramel (MILK, lactoserum, sugar , BUTTER, aroma), emulsifier: SOYA lecithin, natural vanilla and coffee extract], HAZELNUT, ALMOND, NUT, PISTACHIO, CREAM, fresh fruits, fuits pulp, BUTTER, MILK, coffee, glucose syrup, inverted sugar, buckwheat, ginger, tea, alcohol, LACTOSE, PISTACHIO paste (ALMONDS, PISTACHIO, sugar, HAZELNUT oil, natural colorant: chlorophyll, bitter ALMOND and vanilla natural aroma, emulsifier: SOYA lecithin), HAZELNUT paste, chestnut paste (chestnuts, sugar, glucose syrup, vanilla pod), grated coconut, cocoa powder, salt, dextrose, truffle, crêpe dentelle (WHEAT flour, sugar, MILK, anhydrous MILK fat, MILK sugar, MILK protein, salt, malt flour, baking powder: sodium bicarbonate), thin buckwheat galette (buckwheat flour, fresh BUTTER, sugar, EGGS, salt), essential oils, varying proportions of spice and aromatic herbs blend, gold foil, gellant: pectin, stabilizers: citric acid and sorbitol, decor colourants: E171, E124, EI02. Ingredients: BUTTER, sugar, CREAM, glucose syrup, LACTOSE, fruits pulp (sugar, pineapple, apple, strawberry, cherry, raspberry, passion, lime, pear), fruits juices (orange, lemon, lime, yuzu), fruits (cranberries, lemon, strawberry, banana, pineapple, cherry, pear, strawberry), buckwheat, cocoa, cocoa butter, candied orange, MILK, tea, inverted sugar, HAZELNUT, SESAME, SESAME paste, ALMOND, coffee, salt, ginger, lemon zests, NUT, spices, gellant: pectin E440i, rum, chocolate (cocoa bean, sugar, cocoa butter, emulsifier: SOYA lecithin, natural vanilla extract), antioxidant: citric acid E330, colourants: (E124, E141i, E141), essential oil of sweet orange. Ingredients: chestnuts, sucre, sugar, glucose syrup, sorbitol, vanilla, E202. Maison Le Roux Chocolatier et Caramélier®, Great Chocolate maker and "Caramélier", Henri Le Roux is the creator of the famous C.B.S.® « Caramel au Beurre Salé » (Salted Butter Caramel). He selects the top-quality cocoa beans and bests chocolate couvertures for his subtle garnished creations. Visit our online Shop to order your assortments of caramels and chocolates and discover our other sweets. Illustrations are non contractual. Copyright © Maison Le Roux 2019. All Rights Reserved. CBS®, Caramélier®, Bonsoncœur®, Force 8®, Louison®, Ch'tou® and Truffe de Truffe® are registered trademarks by Henri le Roux Caramélier et Chocolatier®. Click here to learn how to control cookies.